Wow! That is all I can say when I saw the Radius Scuba Toothbrush, It's huge! What makes this toothbrush stand out is, well, everything. Let's begin with the large handle. This allows for you to have a firm hold the whole time so no more slips in the sink. 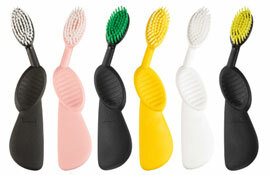 Next, you have the head of the brush which is double the size of a normal toothbrush which makes for a clean mouth. My gums always seem to bleed when I brush my teeth. When using the Scuba Toothbrush I was pleased not to have any bleeding. The wide huge head massages the gums to help reduce the bleeding. The Radius toothbrush has soft bristles to help reduce enamel erosion. Are you a lefty? The Radius Scuba has a toothbrush made for you with a left hand handle grip! No more being left out. The thumb grip is great to keep you from losing the toothbrush mid brush or it slipping while brushing causing you to bleed. Each Radius toothbrush is made to last 3 times longer than a normal toothbrush so think of the money you will save. You can see all the many choices of toothbrush's that Radius has to offer by clicking the link here, which they have one for everyone in the family. Disclosure: I was given a toothbrush to help with my review. All opinions are 100% mine.